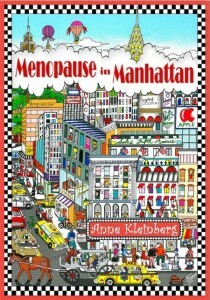 Menopause in Manhattan-what a great book, I really enjoyed it and looked forward to your next book. I can’t remember when I had so much fun with a book! It was just the right combination of sophistication and warmth to capture my interest and make me laugh out loud. I loved the characters — I’d enjoy meeting almost any of them. For a reader of the “boomer” demographic this book really offers a reminder that you don’t have to be twenty to have an interesting and fulfilling life. I hope this isn’t the last we hear of these characters or this exciting new author. 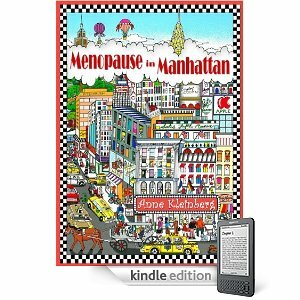 I just finished your book, Menopausal in Manhattan and WOW! What a fantastic book, i certainly had the tears rolling when I got to the letter from Tillie to Elie about the ring. You are a wonderful writer and I hope you have more books in the works! I’m also from NY and now live in Israel…I am going to have my mom read this book as I’m sure she will be able to relate a bit to Elie missing Lexi, as shes so far away. I so enjoyed this book! It is fun to read—full of interesting details of fashion, food, and design. The characters are well-developed and it was fun to follow the happenings in their lives. Laughed, cried, and cheered….. can’t wait until the next one. Elie is a heroine for OUR time! This is a very fun read….fast and engrossing and the storyline is just delicious. Loved the message AND the medium! This novel has my wholehearted recommendation and Elie Sands is my new hero! Every woman who has ever wondered about life should read this book! This book is a great read! The characters are so well developed that you can close your eyes and imagine them in your head. I learned so much about art, food, friendship and the importance of having a good “sense of morality.” I look forward to what has yet to be written by this author and will share this book with family and friends who are “women of a certain age” as well as “silver and sage.” Well done, Anne! I thoroughly enjoyed this book. With life-like characters that I loved being surrounded by and some of the most realistic dialogue I have ever read, I just couldn’t get enough of this novel. Kleinberg wove her wealth of experience and learned skills into a story that I found to be rich in detail. Consistently, we get the best and worst of interior design, food and fashion; as well as the feel of both New York City and Israel, which all work together to enrich the plot and transport us right into the heart of this tale. The Jewish culture presented in the novel was just one more beautiful strand of detail. I was intrigued from the first chapter, loved the way she handled flashbacks, laughed aloud several times and felt as if I had gone on a grand adventure. Hopefully she’s hard at work on the next one! Not only in the book there’s a lot to read, this evening your site and blogs kept me busy. I ended up with an empty bottle of cabernet sauvignon. Today I sent your books to three Dutch publishers. Imagine all three calling you at one day, a women’s fight about you and your book (and $$ going up)! I really hope they contact you soon! So happy to hear from you. Did you really finish a bottle of Cab with the book? Yikes!!! Added your daughter’s cool website to your comment. This book made me laugh, smile, reminisce, and at the end cry and cheer. The book has all the elements that makes you look forward to cuddling up with it and read – romance,conflict, work and career, fashion, glamour, friendships… IT HAS IT ALL. I hope the writer will follow up with the concept of “Silver & Sage” in every direction it take it. I am looking forward to a sequel or to another book from this high spirited writer. I enjoyed every minute I spent in this story. It felt as if I was right there with the characters every step of the way. They had me crying, laughing and wanting more. I was routing for Elie every step of her journey. I truly enjoyed this book. I just finished your book with tears in my eyes. I loved it. It made me laugh, smile and reminisce over all the familiar places in Manhattan and in Israel. It made me miss the fashion, the cloths and Bergdorf. As I said at the end it touched me so, I cried. I really loved and appreciated your acknowledgments – you are a real mensch and an inspiration. Can’t wait for your next book. the movie or the TV series. Who plays David? I can really see Anne Bancroft in the part of Elie (it is a shame that she never would have the chance). Inspirational. A must-read for any woman wanting more out of life. This is some of the wittiest prose I’ve read in a long, long time. It’s also far deeper – and more compelling – material than a quick glance at the title might suggest. Yes, it’s Manhattan, done with a clever “insider’s eye” and a lot of panache. But it’s also the story of a woman and her closest friends facing some of the toughest (and more surprising) things that life can throw at you, and dealing with them in bold and admirable ways. A witty, captivating and believable story. Evokes many emotions in the reader. Very descriptive, thereby allowing one to create the places and characters in one’s own mind. Quick and fun to read. A++ for Kleinberg’s first novel! I love inspirational, talented women. I am approaching 50 fast – Oy!!! Kudos to a most enjoyable book which was enjoyable from the first page to the last page. It is rare that a first time author can captivate an entire family. It was fun reading. It was a book that you cannot put down till the very end. I can’t wait for a sequel to this great story. Thanks from my whole family for an enjoyable weekend of reading. I thoroughly enjoyed Anne Kleinberg’s debut novel. Anne’s descriptive and colourful writing style transported me to the various scenes and I became fond of the characters. A great read from cover to cover. 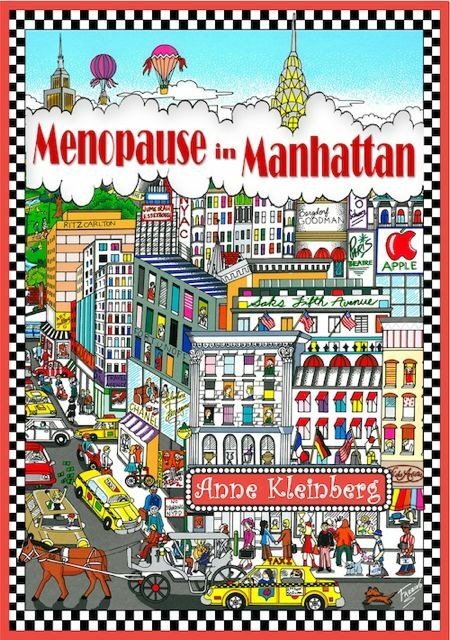 Menopause in Manhattan is a fun and breezy read. Perfect for a beach or vacation read. Being from NYC I enjoyed many of the references and typical NY characters found in the book. I loved this book. The writing was descriptive, the relationships were true, and the story was entertaining. Elie seems like a person you could actually get to know and her close friends are a hoot! This first novel by the author would certainly be a hit as a movie. I am looking forward to the next novel, Anne. Perhaps a sequel? What a great read! The characters are so well developed that you can close your eyes and imagine them in your head. I learned so much about art, food, friendship and the importance of having a good “sense of morality.” I look forward to what has yet to be written by this author and will share this book with all of my friends who are “women of a certain age” as well as “silver and sage.” Well done, Anne! After reading this book I feel like I have made close friends with all of the main characters! They are all so unique yet believable, and above all fun! Nothing like a woman who knows what she wants or through her experiences learns what she wants, and after a little hard work she gets it! It makes me want to move to Manhattan! Loved it and sad it’s over! Looking forward to the next installment. i just finished the book, again and loved it even more! I feel like Elie is a member of my family. I’m ready to read the next installment. Lots of love and good wishes. I’ll be looking for your name on the NY Times best seller list. Just reread the book and loved it! … You made lots of little changes that were really well thought out, and it still has the verve and life of the original. The book looks like a quality product too, in terms of the graphics, paper, everything. I wish the book every success it deserves and thank you for letting me be a tiny part of it. The amazing cover gives just a hint of the pace inside. It was a joy to read and to become part of the NY-Israel scene through your eyes. It was a wonderful, vibrant, colorful read and great fun. I’ve just completed reading it. To say that I enjoyed it would be an understatement. To say that it wasn’t a thorough delight would be false. To say that I expected nothing less of you than a thorough foray into the wonderful Manhattan-Israel mix of amazing, over the top characters, would be minimizing the absolute fun I have had over the past few days, not being able to put it down. It was alive, vibrant, colorful, tender, humorous, warm. But mostly, it was you. PS. The description of Michael’s family trip to Dollywood had me doubled over with tears in my eyes. This was a piece of achievement !!! Congratulations and Wish you a great success. I loved it so much…. waiting for the next novel by ANNE !! It looks like just yesterday that I left Israel and in this short time, you have written a book and a cook book. Busy bee!!!!! I congratulate you on this achievement and can’t wait to read the book. I wish I could say I wrote it since you left. I started it four years ago! And its been edited and proof-read and finally formatted and printed. We miss you and your gorgeous smile here – when are you coming back? The cover is ADORABLE! Did you design it? Love it–love your name “in lights!” xxooj. Anne, seems I seeing a little bit of you from the two daughters Can’t wait to get a couple of copies for myself and my friends! You think so???? That’s a compliment – but actually I’m more in some of the other characters! Congratulations and Wish you a great success. I am so Glad to see that finally all your effort emerge to world in the form of this book. Looking forward to read this book at the earliest. Whenever I see the Title, I want to ask you how you came up with this title or may be I have to read the book to get the answer? As you had shared about the difficulties you had faced in this process of book printing , I am sure all those learning will make next book release much comfortable. Hi Anu! The title was thanks to a Jerusalem Post writer – she just came up with it with a number of other name suggestions and I just loved it! I miss you! Come back here!!! Huge Mazal Tov and lots of Congratulations! You are a great and talented writer so keep doing it. Please give the world all the presents of mind you can! Love that Presents of Mind my former business partner and wonderful friend! I’m so happy to know that you finally launch your book overcoming lots of obstacles. I can’t wait to read it! Love you Rona – and your constant support! Did you finish it yet??? As a bookworm, I always have five books by my bedside i.e., I am extremely selective in what to read during my golden time of the day, Anne’s Menopause in Manhattan is on the top list. I enjoy reading it so much, I love the spirit of women in this book and much more …..! It’s highly recommended! Must Read! And I love your spirit Andrea – my new and precious friend! I was honored to be involved in the editing of this book and found myself wrapped up in the characters and transported to the scenes that Anne so colorfully describes. A year later the pictures Anne painted in the book are still vivid in my mind. Couldn’t have done it without you Deb!